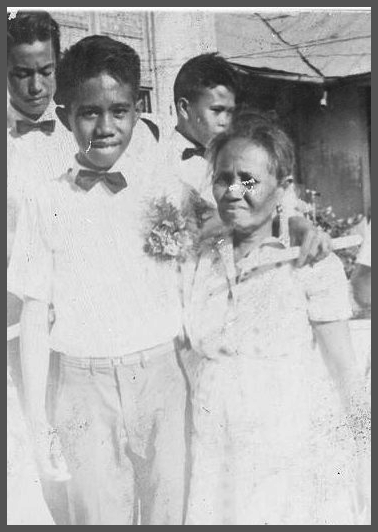 I remember one special occasion with my beloved mother 46 years ago when she attended my elementary graduation or closing exercises sometime in 1966. She proudly pinned me the ribbon of recognition as the outstanding grade 6 pupil in Industrial Arts. Then after the ceremonies, she handed me a graduation present given by Manong Cesar, one of our late eldest brothers and it was Inday Naiding (Zenaida Iligan), my first cousin, the niece of my mother whom I remember greeted me as an A-I pupil when I paid a visit to her house a day after our graduation. Lorenza Iligan-Camporazo, my mother was really very proud of me for such achievement I had received. I know how happy she was at that time. What I am today is the product of her efforts to be what I am, of course. How I wish she could be here today. Anyway, what I have to do is to reminisce Nanay's sweet loving memories with me when she's still living. Nanay has taught me something which I've treasured so much as long as I live or even in after life. She's a good mathematician. I remember when I was doing my assignment in math in Grade V and kept on memorizing in rote the different multiplication table. She told, "Why bother memorizing those multiplication table, when you could do it through addition." I was surprised and I didn't have any idea that it could be possible. She taught me the short-cut of doing it and I applied it. Later I loved to do it and math became my favorite subject which before I hated so much. Another thing she influenced me was about music. My mother had a good voice. But I seldom heard her singing. One afternoon, I was singing a Visayan folksong, "Dandansoy" which I learned from my neighbor, with a broken lyrics. She joined with me in singing with the entire song. Then she taught me other Ilonggo songs like "Laylay sa Payag", "Tuburan", "Rosing", "Walay Angay", and "Ili-ili Tulog Anay". No wonder why Manong Jaime, our eldest brother was a good operatic singer. He used to sing the songs of the Great Caruso, Mario Lanza like "Granada", "Be My Love", and "Because" He's always joining in any amateur singing contest every fiesta and also to our neighboring towns, and he won fabulous cash prizes. One occasion I noticed that while I was away from home for scouting encampment somewhere in Himamaylan, Negros Occidental, upon arriving home, I saw her lying on the mat on the floor. I asked her, "Nanay, na anu ka?" (Mother, what happened to you?" "Nagamasakit ako, Pero ayo na ako," (I'm sick, But I'm well now. ), she replied. The same had happened in several out-of-hometown activities I participated in. Every time I went home I noticed her always got sick. I pitied her. She's affected when I'm away from her. I know how much my mother felt about me every time when I'm not around for quite sometime for I was the youngest of her six children. Another situation I recall when I informed her that I'm going to get married at the age of 21. I was still studying in college at the moment. Well, she just simply asked me, "Do you love that girl?" I was perplexed and asked myself, "Is it really love? Or just an infatuation?" "Well, she said, go ahead." And the last question I remember to ask her was to permit me to join or be baptized with The Church of Jesus Christ of Latter-day Saints. "'Nay mapabunyag ako sa Mormons?" (Mother, I want to be baptized with the Mormons?" Again she replied simply, "Daw wala man ako nakakita sang sala o malain sina nga simbahan, ngaa indi ka magpabunyag?" (I haven't seen anything wrong with that Church, why not go on to be baptized?" My late father who was just around didn't react. You know my father was very supportive with my mother's decision. They're supporting each other. 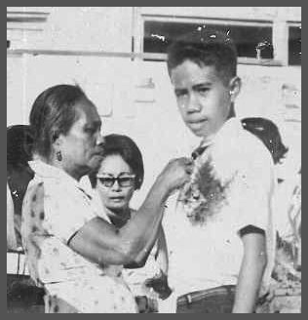 These are simple memories I ever have with my dear mother, Lorenza. Followed is a "Mother's Song" popularized by Nora Aunor, my contemporary and favorite singer, that every time I hear it, my good old, loving memories with my beloved mother become alive. My sister by my side. I found my dream come true. As you put me to bed. I wish you were still here with me today. So children obey your mother. Your mother is very talented; you must have been missing her very much. I'm wondering how many gifts you have gotten from your mom! Thanks Robi. I inherited her intelligence, among others. When she died I've lost "the best of all" per se. But I know she's still living with my beloved father in the "world" of our Living God. I may not be a Nora Aunor fan, but I appreciate this song now because my mother is not here with us right now. She's working overseas and it's been 3 or 4 years since she have come home. This is a bittersweet post. I'm sure your mother is very proud of you. This is a very sweet tribute for your Mom. She must have been very, very proud of you. By the way, I love the lyrics of the song. Yes, it's indeed a loving and sweet tribute to my mother dear. We're also very proud of her in bringing up the way we should grow up according to the Lord's nurture and admonition. Your post made me miss my Nanay too! To my grams who I had a great chance to have spent my childhood with. She's strong, practical, and very jolly. I know she's looking down on me smiling knowing that she raised me well. You had a great mom! kudos to her achievements. I am sure until now she's just proud of you. I knew that song by heart but I avoid singing it for now, it makes me sad. Anyway, my mom's still around and I do always makes the most of our time being together. I miss my mom right now (she's in Zamboanga to attend a conference) after reading this Sir Gil. ang ganda ng post about mother.nakakatouch. if we all have a mother like Mrs.Lorenza ,all the people will be like Sir Gil, responsable, mabait,mapagmahal at may takot sa Diyos.Happy Mothers Day Sir! I literally cried upon reading this post. so love dearly and I can't imagine myself living without her by my side. mothers are BEST... and can never be replaced with another one. Sabi nga nila, ang bunga'y nanggagaling din sa puno. I'm sure your mother is proud to have an accomplished and loving son like you. sir Gil your post added my longing to be with my mother right now, plus the music squeezes my heart. So touching... a lovely post indeed. She'll be proud.